CEPSA Service Stations – Spain. Burotec continues its relationship with the major oil and gas Spanish companies. The project involves the study of the CEPSA service stations throughout the Spanish territory for the installation of LPG (Liquefied Petroleum Gas). University of Essex – United Kingdom. This project involves the construction of 420 student rooms with private bathrooms, 228 student rooms, a pavilion for laundry, cafeteria and student lounge and an electrical substation. The CO2 Capture Project in Northern part of Spain. A partnership of several major energy companies working together to advance the technologies that will underpin the deployment of industrial-scale CO2 capture and storage (CCS). ProjectCenter is used to optimize the flow of communication and control of documents. New IKEA store in Sabadell – Spain. It will be the largest in Spain with an area of 40,000 square meters. The new store, with EUR 60 million of investment, will have 2.108 parking spaces on two floors of underground parking. Restructuring and expansion of “Ecole Hoteliere de Lausanne”, Lausanne – Switzerland. EHL, the first hotel school in the world, has chosen ProjectCenter for the expansion of its headquarters, to optimize time and achieve cost efficiencies in the project. OXY-CFB-300 ENDESA – Spain. Compostilla OXYCFB300 is a project that includes capture, transport and storage of CO2, the main aim is to validate a new technology, flexible and competitive at industrial level that it will renew the existing fossil fuel power plants from 2020. Great Island Project – Ireland. This project includes the construction of a new combined cycle unit in the Great Island central, Ireland. With an investment of 330 million Euros, was awarded to the consortium of Cobra, Dragados and Initec. Marlborough Hill Campus – United Kingdom. Restructuring of George Eliot school, school multi-ethnic, multi-cultural and multi-lingual. This restructuring includes better facilities, bigger and brighter classrooms and spaces dedicated to learning and play. Puerto Venecia, Zaragoza – Spain. It is the largest shopping and leisure center in Europe. Its 206.000 m2 of GLA (gross leasable area) hosted the largest fashion mall in Spain with more than 72,000 m2 and the largest retail park in Spain of more than 83,000 m2. Expansion of International Medtronic headquarters, Tolochenaz – Switzerland. The project includes the restructuring of the manufacturing of implantable medical devices Department and the Medtronic European Centre for Education & Training. IKEA – Spain. The different teams in the new Ikea stores are using ProjectCenter to manage their projects lifecycle and ease the exchange of drawings and information as well as for the project execution control. Tower Hamlets BSF – United Kingdom. The refurbishment and construction of various schools in London, the largest investment of its kind in the city with a budget of over 200 million Euros. The project is called BSF (Building Schools for Future). Gran Plaza 2 Mall, Majadahonda, Madrid – Spain. Spanish Society for Shopping Centers (Sociedad de Centros Comerciales de España (SCCE) has chosen ProjectCenter as collaboration platform in its new project “Grand Plaza 2”, the construction of a shopping center of 60,000 m2. Toledo Hospital – Spain. With a construction budget of $400 million, the Toledo Hospital, will be built on a 360.000 square meters parcel provided by the local government and it will count with the latest advances in medical infrastructure and equipment. It is composed of ten independent buildings interconnected through an intelligent underground network and it will provide service to a region with a total population over half a million. Demarcation of roads in Castilla y Leon – Spain. ProjectCenter has been used to exchange in a quickly and easily way documents and information of different works realized on the demarcation road of Castilla y León region. Broomfield Hospital PFI – United Kingdom. Bouygues has been responsible for the refurbishment of the hospital in the county of Essex, UK. Bouygues has also built a maternity building, a outpatient department, different new outpatient surgery rooms and a helipad on the roof. Photovoltaic Power Plants – Spain. Isolux Corsán Group has carried out with ProjectCenter this great project, the first of its size in Spain, and has installed 25 new photovoltaic plants throughout the Spanish territory. Automated Logistic Center – Spain. ProjectCenter helps team members to manage in a central repository all the project information such as drawings, specifications, meeting minutes, planning and correspondence. Mercadona and its collaborators and partners in the project are able to access, edit, update, distribute and track changes of the documents in real-time, from any location and at any time. Mercadona plant and warehouse for frozen food in Valencia – Spain. Mercadona has chosen ProjectCenter as a management tool in this new project, to optimize time, save cost and increase the efficiency and competitiveness of the project teams. Rebranding of the Peugeot dealer network in Spain. Peugeot has chosen ProjectCenter as document exchange platform for rebranding its entire dealer network in the Spanish territory. Solar Thermal Power Plant in Alicante – Spain. First solar thermal power plant of these characteristics in the Valencia region and one of the first ones in the rest of Spain. The installation of Villena produces enough power to supply a population of 80,000. Isla Azul Mall, Madrid – Spain. Islazul is an area of trade, leisure and services (180 establishments) performed by Lar Group with an investment of EUR 255 million and a construction area of 256,000 m2. The “Magic Box”, Madrid – Spain. 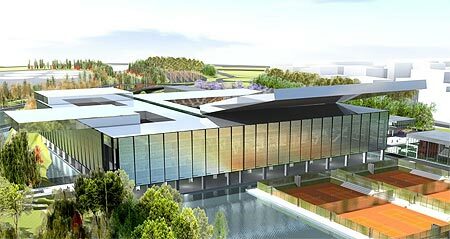 High quality, design, functionality and environmental friendliness are the characteristics of this tennis complex designed by French architect Dominique Perrault, for the realization of which has been used Project Center. Toll road in central Greece. 231 KMs executed and managed by the consortium Cintra, ACS and GEK Group to the Government of Greece, joining the group of roads PATHE (Patra, Athens and Tesalónicas) and Egnatia motorway. Combined cycle power plant of 400 MW, Huelva – Spain. Endesa counted on ProjectCenter, to optimize the communication among project teams located in different parts of the world and control of project information. Turnpike Cernadova-Medgidia – Romania. Turnpike carried out and managed by the Portuguese construction company Soares da Costa for the Government of Romania. This turnpike links Medgidia and Cernadova. Toll Road Zenica, Mostar, Bosnia and Herzegovina – Sarajevo. Turnpike by Portuguese construction company Soares da Costa for the Government of Bosnia and Herzegovina and linking the cities of Zenica, Sarajevo and Mostar. Toll Road M4 Kilcock-Kinnegad – Ireland. Extension of the general road network in Ireland, carried out by the Spanish construction company Cintra and Irish construction company SIAC.